Using CustomCollegePlan software, every college consulting package receives a personalized college application tracking software with its own dashboard that helps manage all deadlines, tasks and files. Jolyn Brand enters students into the system, along with their profile, SAT/ACT scores, career interests and customized college list. 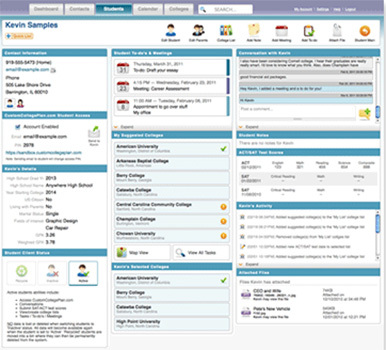 This dashboard even gives students the option of receiving text message notifications for important tasks, deadlines and test registrations. They can use this feature to communicate with Jolyn directly or to ask questions. Very handy for students who don’t frequently check emails! Once the parents and student are given access to the dashboard, they can view each college using the “How do I match up?” feature which shows the student’s test scores compared to the average student at the selected college. This is a great tool for selecting and reviewing colleges. Additionally, this task list and each student’s calendar can be customized for the family’s schedule. Students in band or football can complete tasks before August, when practice schedules get hectic. Students going on vacation can plan around those weeks over the summer and students will jobs can tend to tasks on their off-time. Considering that this task list varies for each college, and most students apply to 5-10 colleges, the application tasks and schedule can be easily overwhelming without a program or plan in place. This program enables Jolyn, the student and the parents to track all tasks and deadlines to ensure that no deadline is missed! All college consulting packages include unlimited access to the college consultant for any educational questions or concerns. Get more details or Sign up now. Jolyn has been my college consultant for around two years now, and I have been completely satisfied with her assistance. Any time I needed an answer regarding college admissions, credentials, or really anything at all, she would do her best to provide me with an accurate and helpful answer. Jolyn stands out to me because of her reliability and her effort, as she has made my admission process a breeze, and has managed to nudge me into the door of some of my dream colleges. Note: Steven was awarded a FULL scholarship to a large national university! Congratulations Steven!